This HUD comes with three editions, "Spin & Go HUD Pro", "Spin & Go HUD Pro+HU", and "Spin & Go HUD Plus". The "Pro" edition is great for players who wish to see the most important stats at a glance, the "Pro+HU" edition adds heads-up tracking to the "Pro" design, while those who hunger for more stats will enjoy the advanced "Plus" edition, which displays stats specific to three different intervals of blind levels (10-13, 13-16, 16-25). All three of these editions are included with a purchase of this HUD, and players are able to select which edition they use from within PT4 at their discretion. This HUD has been rigorously tested by over a dozen pro players for nearly a month to prepare it for release. Now it is your turn to get the technological edge you need to dominate this profitable poker format. 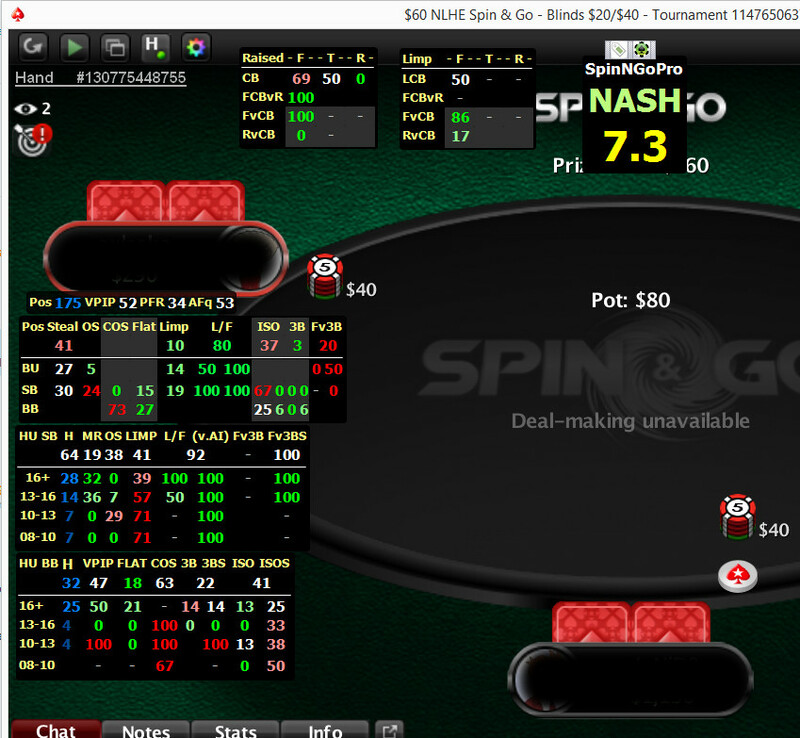 This HUD is an addon for the program PokerTracker 4, a statistical tracker for online poker. 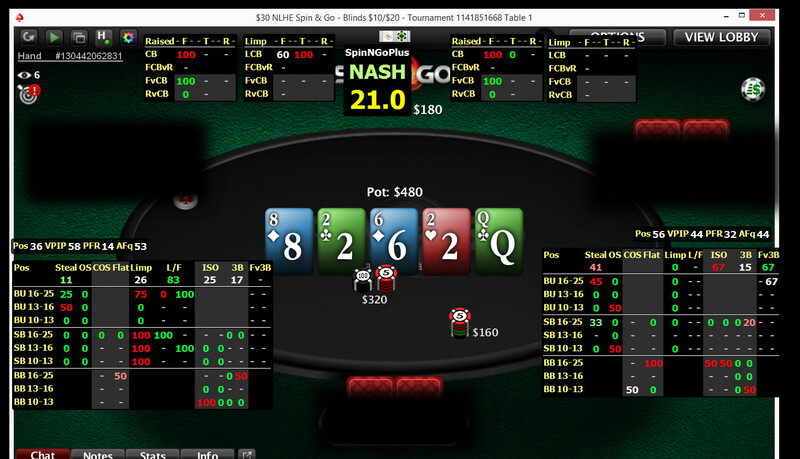 PokerTracker 4 is required to use this HUD. 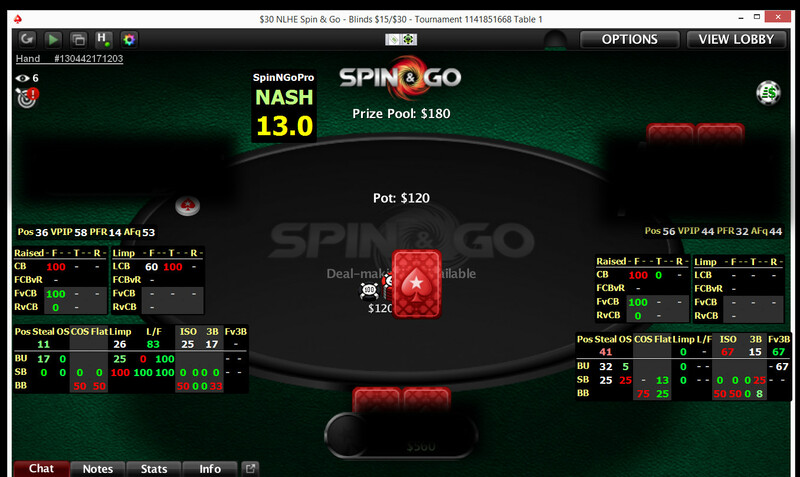 If you have not yet purchased PokerTracker 4, you can buy it from us here: http://www.husng.com/content/buy-pokertracker-and-receive-standard-video-pack-free. We offer two options to buy PT4, at $10 off (the best price on PT4 in the industry) or at full price but with a free inclusion of our Standard Pack video collection (over 400 videos). Within 24 hours after you purchase this HUD, we will activate your PT4 license for access to this HUD, and then your PT4 installation will automatically download and install this HUD with no further action required on your part. This HUD will always be available to you on whatever devices you install PT4 using the same registration credentials, and you do not need to worry about saving back up copies of any installation files. Be sure to completely fill out the checkout form with your PT4 registration e-mail and 6-digit code. You can find that e-mail and 6-digit code in PT4 itself by clicking the "Help" menu and selecting "About".